If you’re familiar with Dell M. Hamilton’s searing performances in recent years about police violence against African Americans, about America and its ideals, her new exhibition “All Languages Welcomed Here” at Salem State University’s Winfisky Gallery from Jan. 10 to Feb. 8, may feel like a surprise. 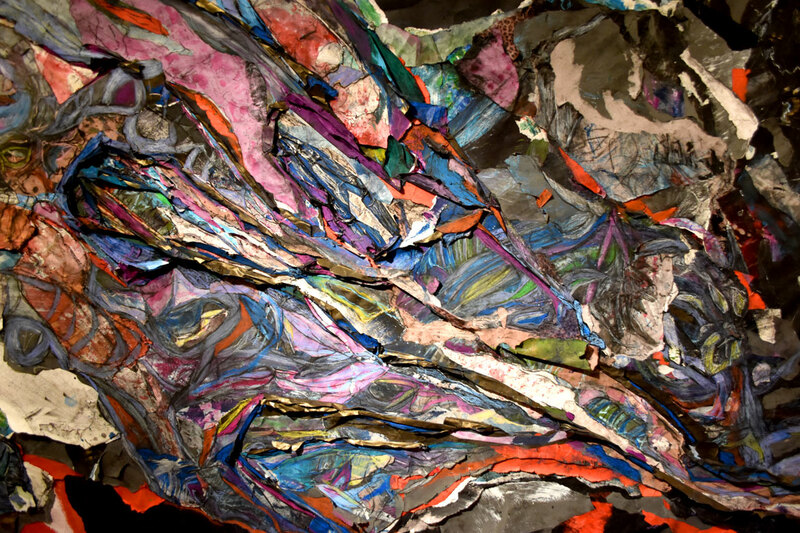 Because at the heart of this exhibition—which includes a gallery talk on Jan. 16 at 2 p.m. followed by a reception from 6 to 8 p.m.—are monumental, abstract, mixed media drawings and collages. Dell Hamilton’s exhibition “All Languages Welcomed Here” at Salem State University, Jan. 9, 2019. Center: “Leviathan, The Blue Knight (aka The Beast),” 2017-2018. 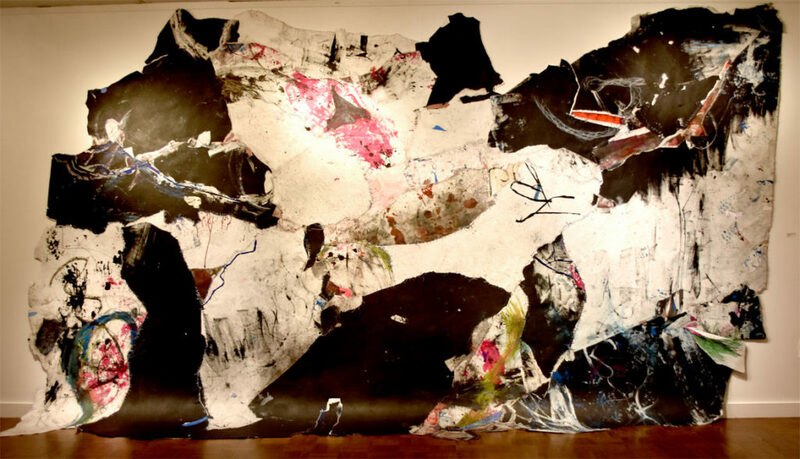 “How Does It Feel to Put Yourself Back Together After You’ve Been Torn Apart” is a 15-foot-wide drawing and collage, scuffed and stained. It’s assembled of papers bluntly stitched together with thread like hastily addressed wounds. 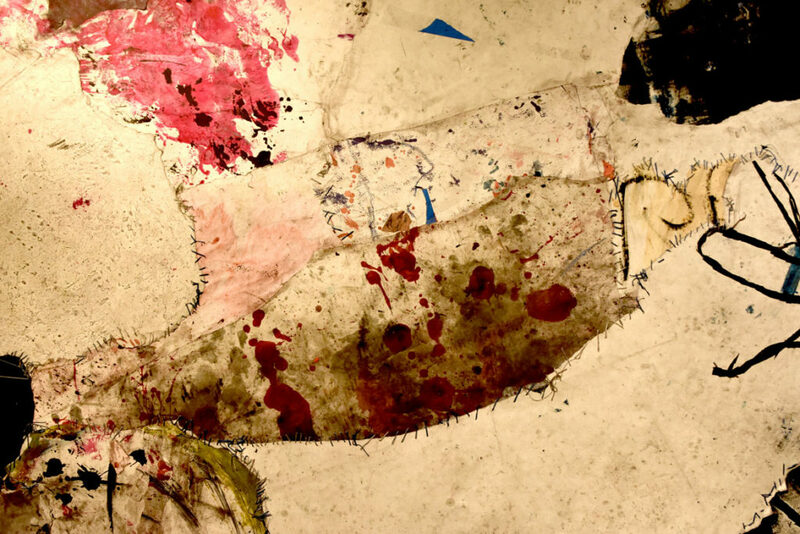 The paper has footprints from being left on the floor of her studio, “picking up people’s different scuff marks as they came into the room.” She describes it as a “cumulative performance.” Red drops splash across the center like blood. Dell Hamilton, “How Does It Feel to Put Yourself Back Together After You’ve Been Torn Apart?” 2017-2018. The exhibition also features “Emulsions in Departure,” abstract images developed through traditional film photographs put through digital processing. They appear scuffed and scratched, smudged with fingerprints. 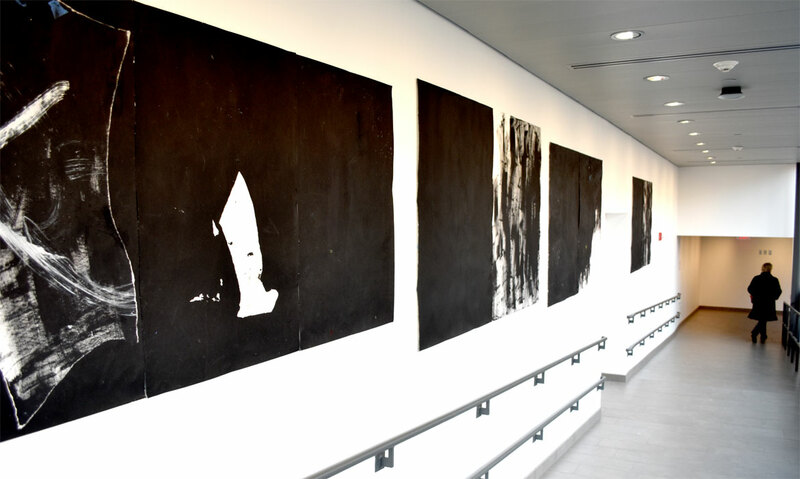 And along a hallway at the school’s Sophia Gordon Center for Creative and Performing Arts, Hamilton has hung a series of tarry black abstractions. 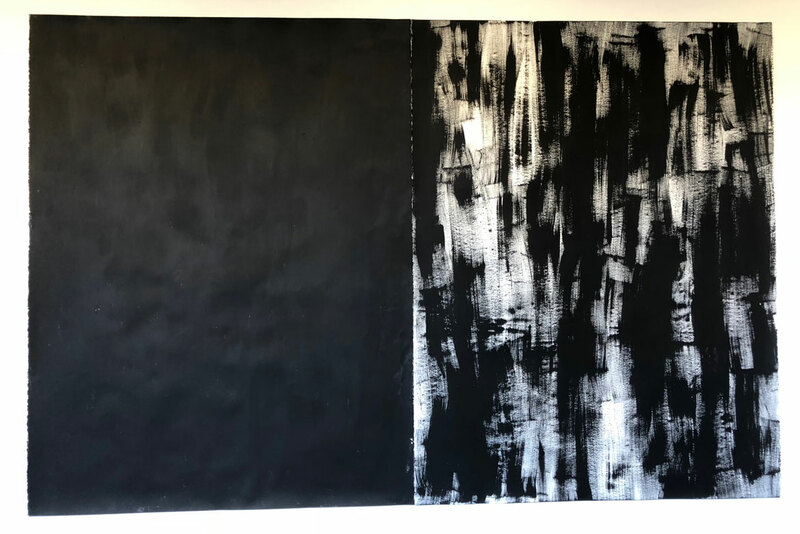 All of her abstractions can call to mind mid-20th century Action Painters and Abstract Expressionists like Barnett Newman, Willem de Kooning, Lee Krasner. 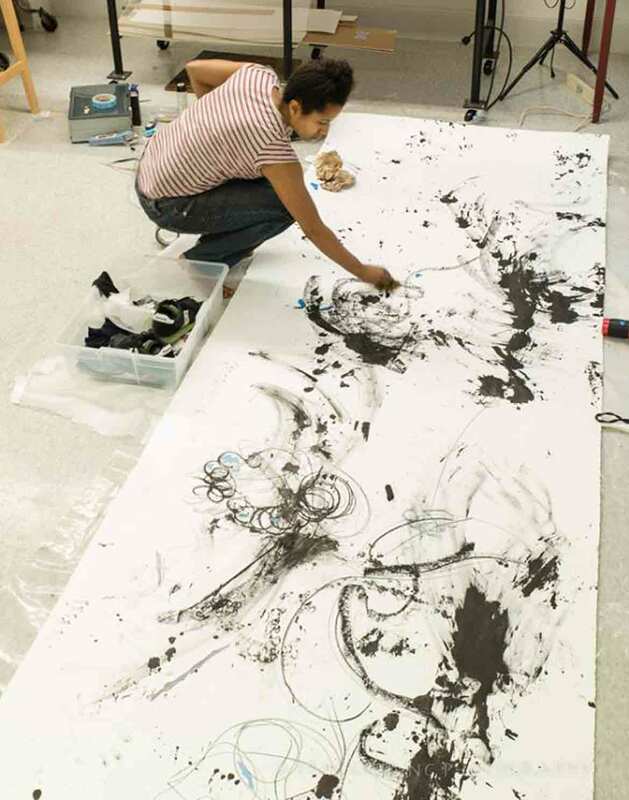 Hamilton also draws inspiration from Jean Michel Basquiat and Mark Bradford. 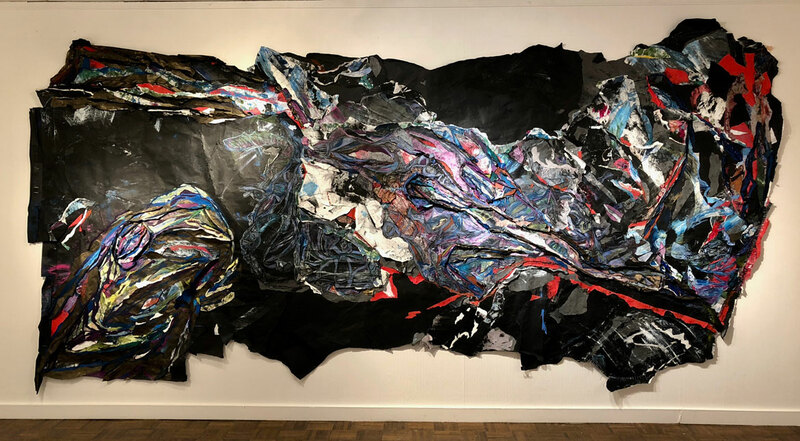 Dell Hamilton, “Leviathan, The Blue Knight (aka The Beast),” 2017-2018. 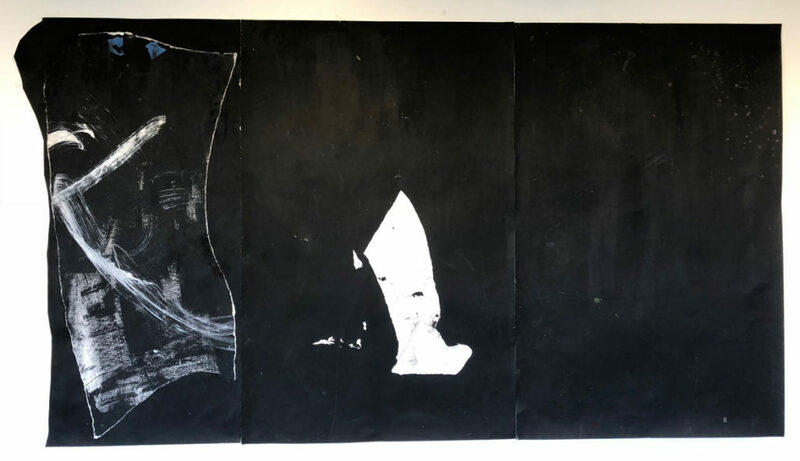 Dell Hamilton’s untitled artworks in her exhibition “All Languages Welcomed Here” at Salem State University, Jan. 9, 2019. Dell Hamilton “The Anatomy of Above and Below,” 2018. Detail of Dell Hamilton, “Leviathan, The Blue Knight (aka The Beast),” 2017-2018. Detail of Dell Hamilton, “How Does It Feel to Put Yourself Back Together After You’ve Been Torn Apart?” 2017-2018. 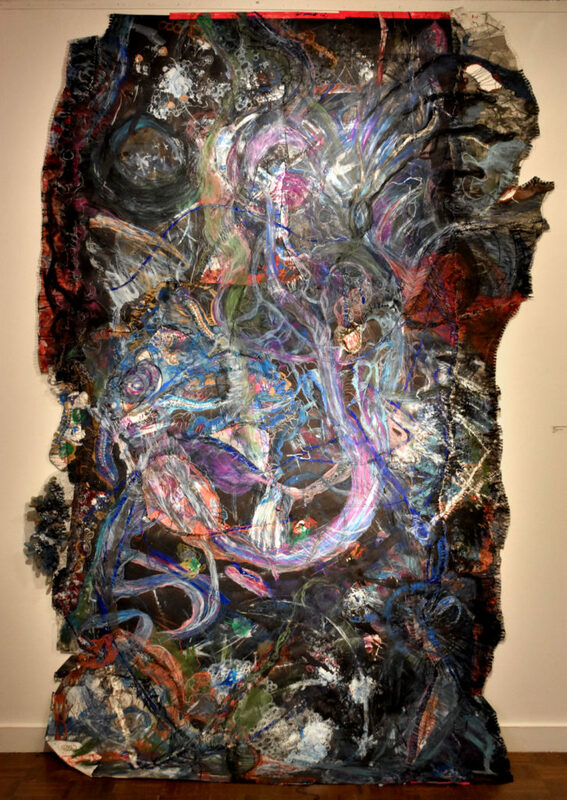 Dell Hamilton’s exhibition “All Languages Welcomed Here” at Salem State University, Jan. 9, 2019.